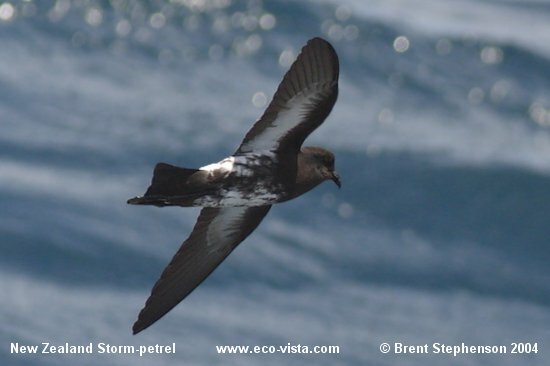 New Zealand Storm-petrel on National TV! On 18 January 2004 we headed out from Sandspit (near Warkworth), into the Hauraki Gulf onboard the ‘Assassin’. Brent had organised a trip with 8 birders and two TV3 crew, as well as Skipper Brett Rathe. 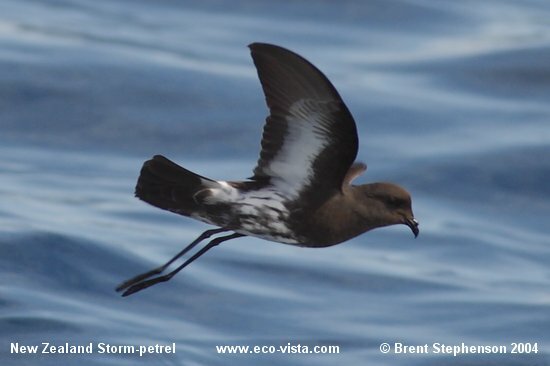 New Zealand storm-petrels had been seen on several trips into the Gulf, since the amazing trip during which Bob Flood and Bryan Thomas made the second sighting of this bird (read about that here). 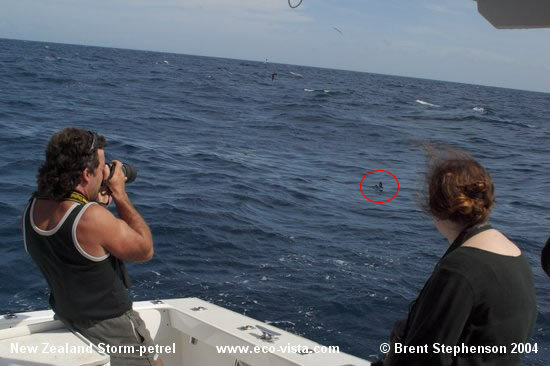 I (Brent) had obtained authority to capture, handle and band a New Zealand storm-petrel if possible, and had made a large ‘butterfly’ net in the hope that the birds might come close enough to the boat, and be able to be netted. Measurements, detailed examination, and photographs were planned in the event of a bird being caught. The bird would then be released. We left the Sandspit wharf just after 0815 and headed out into a brisk northerly wind, with 1 ½ to 2m swell. As we headed through the narrows the swell increased, with some fairly large waves. As we headed out towards Little Barrier small numbers of Buller’s shearwaters were seen, until a little further out when the first Cook’s petrels, flesh-footed shearwaters and white-faced storm-petrels were seen. 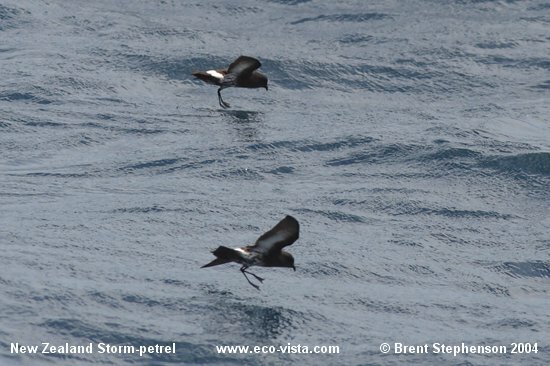 At several places large numbers of 50+ Cook’s petrels and Buller’s shearwaters could be seen. Due to the large swell and the fact that we had a place to head to, we basically just made a b-line straight out towards Little Barrier. We arrived at the same location that Bob and Bryan had first encountered their birds, cut the engines, and prepared ourselves. 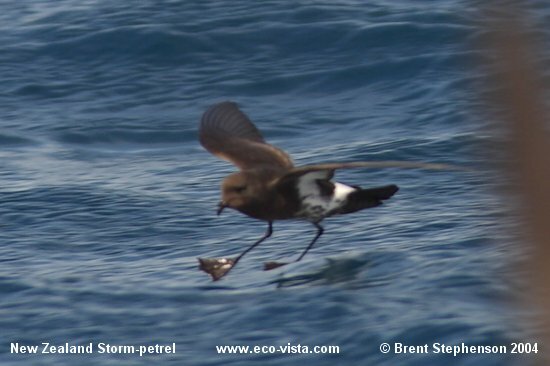 Brett quickly put out some chum and within less than a minute the first white-faced storm-petrel arrived at the back of the boat, followed shortly after by a Cook’s petrel and flesh-footed shearwaters. It was just over three minutes when I spotted a small dark stormie heading straight for the back of the boat, with a distinctive fast flapping flight. I called “Stormie approaching, this has got to be one!”. 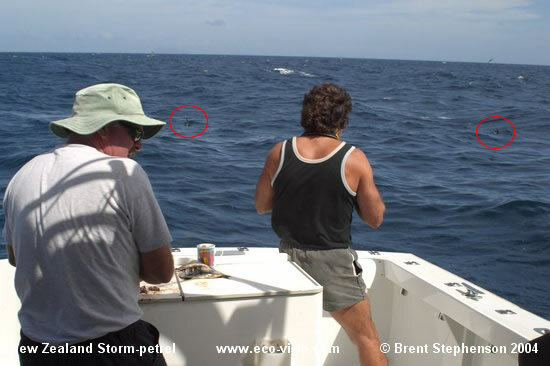 Sure enough a New Zealand storm-petrel came straight into the back of the boat and started circling. It was not long before several more arrived, and we really started to get excited – this was just amazing! Two NZSP in the same photo! From about 1000 until 1405 we drifted with the sea-anchor out, chumming most of the time, and at one stage had at least 11 birds around the boat. These were not fleeting glimpses, they were almost the most common species around the boat! During the four hours we drifted chumming we really were able to get fantastic views and make some important observations. 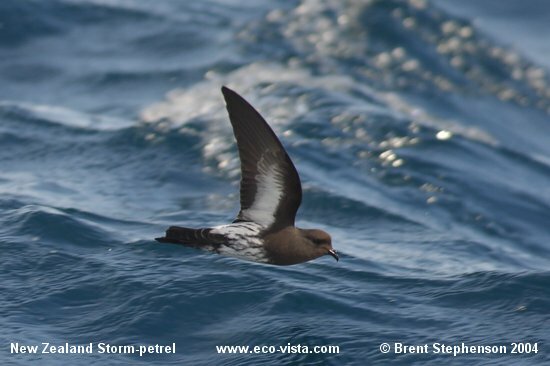 The birds were distinctly smaller than the White-faced storm-petrels, something we had commented on during the first sighting of NZSP out of Whitianga. The structure, size, and flight make them very obvious amongst these other stormies. 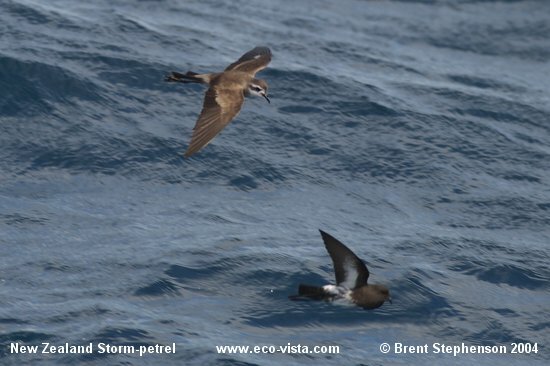 White-faced storm-petrel (above) and New Zealand storm-petrel (below), showing the disparity in size. All birds showed variation on a theme – that is they were all streaked on the white breast and belly to some degree. Usually these streakings were more pronounced on the flanks and sides of the belly, rather than in the mid-line. Some birds were plainly marked, being almost white, with only a few small streaks or spots. Others, however, were VERY heavily marked, being almost completely black along the flanks/axillaries, and often it was very difficult to see if there was any white even in the mid-line. These birds stood out quite conspicuously, however, in all other manners – structure, flight, behaviour, toe projection, etc. – they were the same as the other birds. 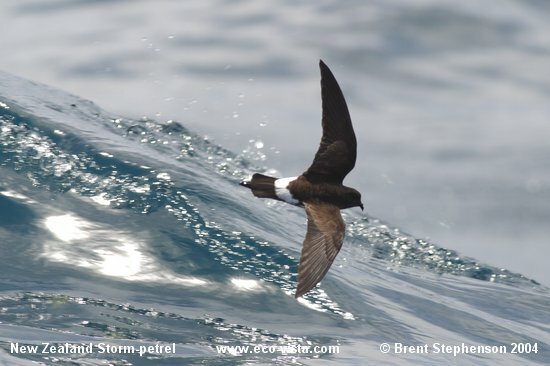 A series of photos showing the amount of variation in the amount of streaking on the breast and belly of New Zealand storm-petrels seen on 18 January 2003. Only upon very good close-up photos of one or two of the birds does even a hint of a pale chin/throat area show. During the course of the day this feature was not detected despite looking for it. The birds present around the boat showed no sign of moult, appearing to be in very tidy plumage. Only one bird seen during the course of the day appeared to have primary slightly shorter than the rest, and no degree of primary or secondary moult is evident from any of the photographs. Moreover, the primaries (from the photos) appear to be quite new and show very little sign of wear. Perhaps then the specimens (all three of which show a pale chin/throat area – see the photos of the specimens here), were collected later in the summer? The date which the ‘Astrolabe’ would have passed by the Hauraki Gulf appears to have been at least mid- to late-February and possibly even early March 1827. This bird appears to show a hint of a pale chin from this angle, one of the few photos showing this. 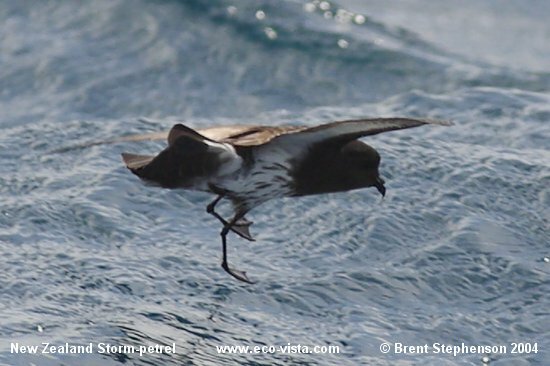 The colour of the webs of the feet can now be confirmed to be black, unlike that of Wilson’s storm-petrel, Oceanites oceanicus. 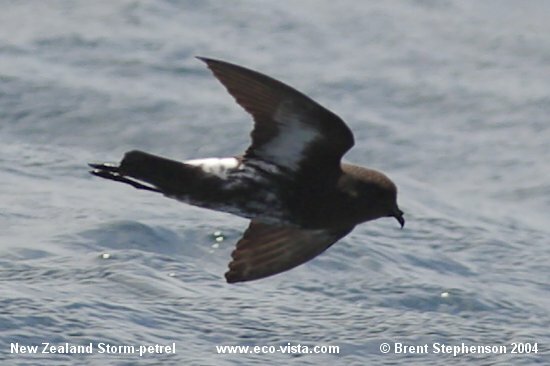 This, amongst other things, adds further weight towards the assertion that the New Zealand storm-petrel is actually a distinct species, rather than a form of Wilson’s. At no stage during the day was any hint of colour seen in the webs of the birds, and the photos (of a number of individuals, corroborates this. All the above photos show the black webs of the feet. 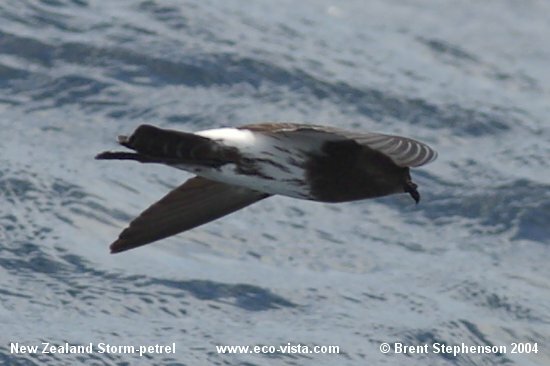 The flight of NZSP is very distinctive indeed, being far more like a Wilson’s than either of the Fregetta’s – Black-bellied or White-bellied storm-petrels. The wings, being very long and pointed, are quickly flapped in a rapid fluttering motion, reminiscent of swiftlets. These rapid bouts of flapping are interspersed with long gliding arcs, with the birds frequently slapping the water with their feet. Often this was seen to displace quite a bit of water. At no stage during the day was a bird seen to hit the water whilst moving quickly, with anything other than the feet. Photographs again show this detail, which is quite unlike the habit of the Fregetta’s of hitting the water with their bellies. They did, however, dip down into the water when feeding, often up to their bellies, without actually landing. The slow motion film shown on 3 News showed perfectly the long whippy action of the wings, which was very distinctive. The whole structure of the bird is far more like that of Wilson’s than either of the Fregetta’s also. The pointed wings, slim body, and flight action, are more similar to Wilson’s, as is the structure of the feet/legs. 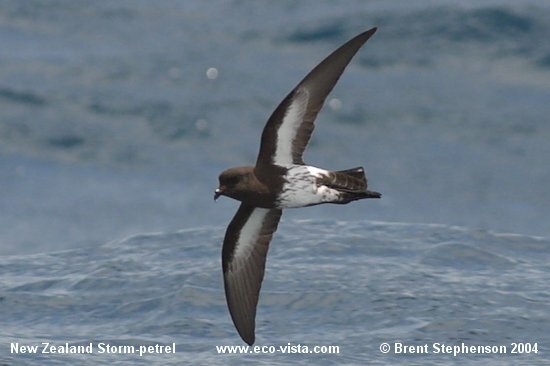 At no stage during the day were any storm-petrels, other than White-faced and NZSPs seen. This is despite four hours of chumming with very observant experienced sea-birders onboard. Anything different would certainly have stuck out a mile, after having watched the NZSPs at such close range. 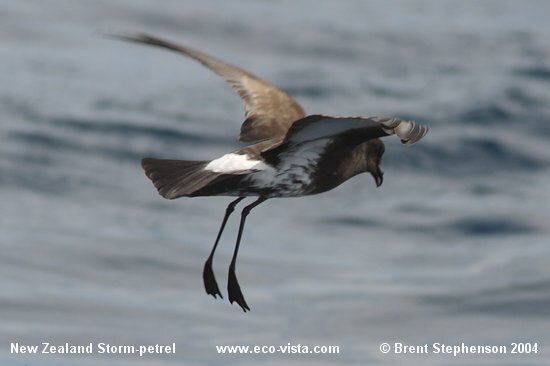 The variation in the plumage of NZSPs, the time of year, and also the lack of verified records of other storm-petrels in the Hauraki Gulf, suggests that sightings of either of the Fregetta’s in this area should be viewed with caution. For records of either of the Fregetta’s to be accepted would require a very tight Rare Bird Report to be submitted to the OSNZ’s Rare Birds Committee. Since 1992 there have been NO accepted records of either species from anywhere in New Zealand. During the course of the day, 3 News managed to get some excellent footage of the birds, and the birders! We did try the use of a large hand-net and almost captured several birds. However, the weather was definitely on the birds’ side being quite windy (10+ knots) and with a reasonable 1 1/2 metre swell. The birds were thus far too manoeuvrable in the wind, and managed to dodge the net just in time. It was felt that the technique would work with calmer conditions. A lot of clicking of cameras was also evident on board, and some fairly good images were obtained, hopefully adding to our knowledge of NZSPs. It might be possible to devise some sort of ‘photo-id’ to identify individuals to a certain extent, as birds often showed distinctive patterns. However, it remains to be discovered (by banding birds!) whether there is variation of plumage between moults. At the back of the boat! NZSPs circled in red.